Posted on January 2009 by The Galletta's Karting Club's webmaster, ChrusherComix Studios. Below is the all-time points list (2006-2008) for the Oswego Kartway's (formerly known as Oswego Speedway Dirt track) Single Wheel Drive Gas Stocker Kart (formerly known as the "Racing Super Yard Kart") Division, the only division (including WKA Jr./Med./Sr./Champ, Open) to count, display, and handicap start weekly and annual points online at the track during that period. The Galletta's Karting Club raced in 31 events during this three year span, and were forced to race with OHV Gas Outlaw class, which had some great races, but also some bitterness due to the inequality of the engines. The club was barred after the 2008 season for the track operator's personal reasons, making these points the final tallies. For the all-time Galletta's Gas Stocker Speedway Points Standings, go to this page. For all-time wins, here. 2-Track totals, here. 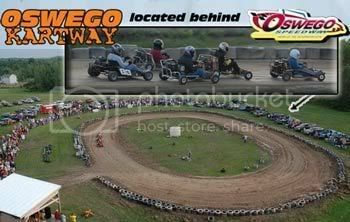 For this page, we use logos designed for the Kartway, which they used for the 2008 season, and discarded all references to when payment was requested. ~ = Includes 2008 Oswego Classic Fastest Time Trial win (with illegal carburetor). - In addition, midway through the 2008 season, gas 5.0-hp flatheads and gas 6.5-hp Over Head Valve motors were split into two classes. The above list does not contain "Outlaw 6.5hp" races after the motor type division, as they now have their own separate points series. They are now known as "5hp Galletta's Gas Stockers" and "6.5hp Gas Open Outlaws." - The Galletta's Point Scoring & Handicapping System (found in depth on our rules page) was used from 2007-2008. However, the 2006 season was scored differently. Since we had no scorekeepers, and no video recordings of any event, we counted only who entered the race and who won each feature. In order to complete the above all-time stats, we counted every driver who started a race with 60 points, and the winner scored an additional 40 points (totaling 100). The result isn't 100% perfect, but since we considered that first season there as an exhibition to our Galletta's Backyard Speedway races, it was the best we could do without videotapes and scorekeepers. It still is effective for point-scoring purposes. - Hence, if there is anyone with recordings from the 2006 Oswego Kartway Gas Stocker events, please forward them to me for DVD and/or cash considerations, as we would be able to more comprehensibly re-"score" the videotaped events. I know at least the Seabrook's have them... please call or write us to exchange copies of races! Thank you. Again... if anybody has tapes of these 2006 events, please forward them to Chris Stevens at Galletta's Greenhouse. I will trade any racing DVDs from our 1998-current collection or pay cash for copies of the 2006 Oswego Kartway events, or trade for any additional angles of our Galletta's or Oswego Speedway events. PLEASE contact me. You may read and discuss the issue here. Thank you. THE GALLETTA'S KARTING SPEEDWAY ALL-TIME POINT STANDINGS are found HERE! The Galletta's & Oswego Kartway Gas Stocker Kart 2-Track Total Point Standings are found here! Due to the fact that the karts are so affordable and the oldest veterans have been racing for nearly two decades, it is one of the most difficult karting divisions to win at, but yet you can be instantly competitive for just a couple hundred dollars IF you're a good driver. You can't outspend your opponent due to our gas-powered stock-only rule, so you must out-race them and out-setup them. In fact, nobody has ever defeated Matt & Chris in the open challenge: race a stock 5hp flathead and stop them from scoring 1st & 2nd in a points season. Though hundreds of people have tried in hundreds of races since the early 1990s, Chris and Matt have scored 1 & 2 every year. But it's not just them you have to race. Our regular drivers are all talented and experienced. You can prove your skills against the winningest karters in the local area AND you won't even have to spend a lot of money to get started! We dare you to try! Make your own or rent one of our racing team karts. Sound like fun? Read on, explore the website, and join us!